Dressing up your dog in funny outfits is a secret pleasure that we’re all guilty of. As long as the costume is not restrictive or uncomfortable, many dogs can learn to love their fun outfits and enjoy the extra attention that comes with being dressed up. Halloween is the best time of year to dress your dog in a hilarious costume that will get him lots of extra hugs and dog treats. Remember those terracotta figurines from the Chia Pet commercials? 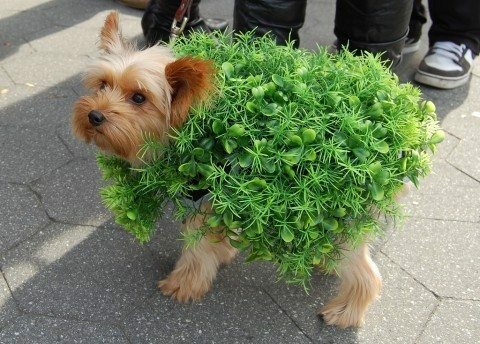 Everyone does — which means everyone will get the reference when you dress up your dog as a Chia Pet planter! It’s an easy dog costume to make. For a small dog, you’ll need an orange baby sleeper that will imitate the look of the terracotta figurine. Then sew fake, Dollar Store greenery to the back and shoulders. Attach the soft, fabric leaves close together, avoiding parts that could stick out and annoy your dog. If your dog is too large to fit in a baby sleeper, a large, modified t-shirt should work well. 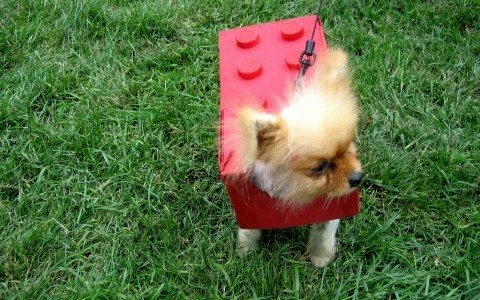 If you are dressing up as a Lego figure for Halloween, then make a dog Lego block costume as an adorable addition to your building set. Use a shoebox (or other appropriately-sized box) to create the base for your dog’s Lego block costume. Glue 6 identical plastic cups to the top. Spray paint the cups and the box all the same color. The costume can be secured with elastic straps found in any craft store. Velcro tape can be added to the straps for easy on and off. This one is a classic. 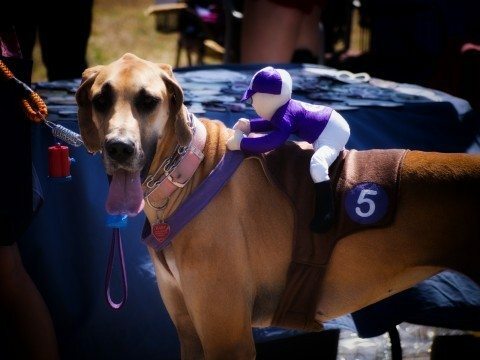 Your dog is the racehorse and a doll is the jockey. Find a floppy, lightweight fabric doll and sew Velcro tape to its hands. Stick the doll’s hands together around the dog’s harness or collar. Make a simple saddle with a bright piece of fabric, then glue (or sew) a big number to the side. This outfit is cute with a head halter. Keep in mind, head halters are a training tool, so it might not make a good costume accessory if your dog is not already accustomed to wearing one. Like sushi? Then you’ll love dressing up your dog as a California Roll. Start with a white baby onesie or t-shirt. Use fabric glue to attach white packing peanuts (to represent rice). Add bits of leftover fabric for the pieces of fish and vegetables inside the sushi roll. Finally, wrap your little sushi with a piece of seaweed made from faux leather or a stretchy black fabric. You will have to dye your dog’s fur blue temporarily for this costume. There are many safe ways to dye dog fur. Specially made dog hair dyes are available, but hard to find. It is also possible to dye your dog’s fur using Koolaid. Simply mix half a cup of dog conditioner with a packet of unsweetened Koolaid drink mix. Comb it through your dog’s fur and let it sit for 5 minutes. Rinse completely. Koolaid mix stains very easily, so this could become a very messy project. 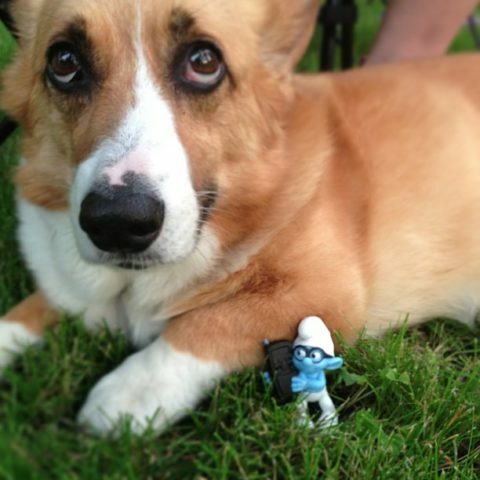 Once your dog’s fur is blue, add a white baby hat or modified sock to create that classic Smurf hat. A white baby tank top makes a great Smurfette dress. IMPORTANT: Do not dye your dog’s fur if they have any history of skin sensitivity or allergies! 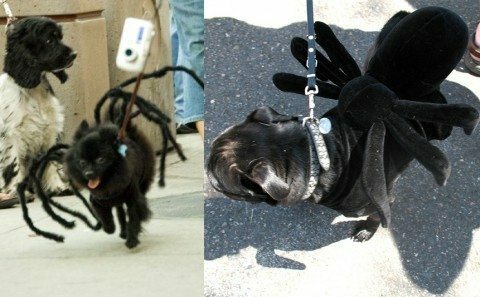 If you want to get a lot of attention (and your dog can take the extra screams and sudden movements from people who become frightened), then you might consider making a dog spider costume yourself. Buy a large spider prop from the Halloween section at any craft or department store. Cut the legs off and attach them to a black dog life-vest or a regular black t-shirt using these tips. Or, if you’re up for a little more sewing, follow Martha Stewart’s step-by-step instructions for making a spider dog costume. Basically, you can wrap any furry black/brown material around something soft and bendable (like a wire framed bandanas or black socks stuffed with shredded paper) to make the legs. Then glue the legs onto a similar colored t-shirt that fits your dog. Then add a black antenna headband, if desired. 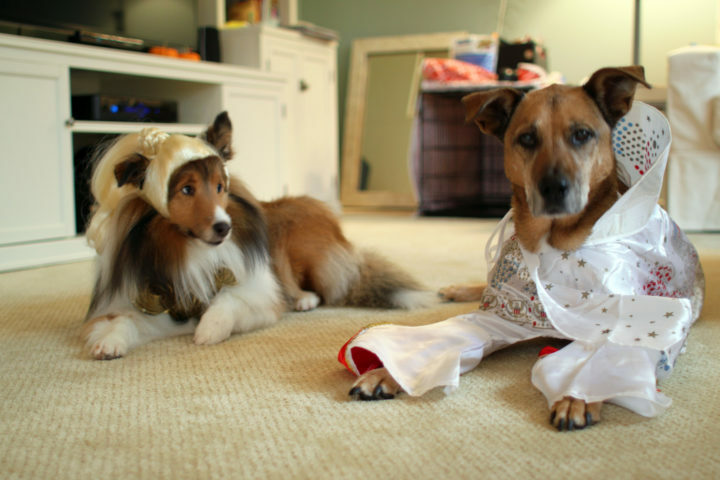 Be sure to practice before Halloween by lavishing your dog with treats whenever he wears his costume without fussing. Of course, your dog’s comfort and safety should be prioritized over his cuteness. Give your dog frequent costume breaks and a few extra treats so he can have just as much fun on Halloween as the kids do.